Over the weekend, fame was on my mind. Not intentionally, I just encountered the subject a couple of times, which is why I’m still thinking about it today. 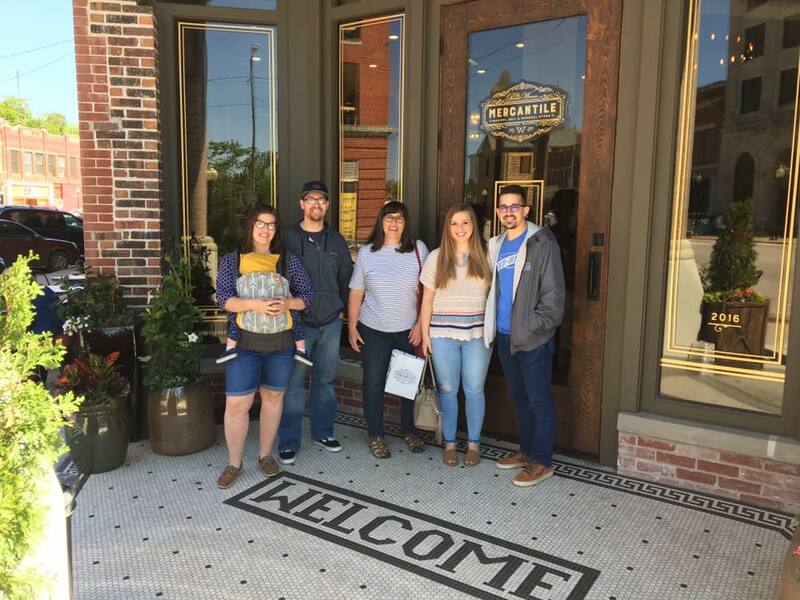 Last Friday, I along with my mom, husband, sister, brother-in-law and nephew went to Pawhuska, Oklahoma, where my sister recently moved, and we decided to visit The Mercantile as made famous by Food Network’s Pioneer Woman. From left: Abby (my sister), Caleb (her husband), Kathy (my mom), Me and Casey (my husband). As we pulled into Pawhuska, my mom filled my husband in on how Ree Drummond, became “The Pioneer Woman.” If you don’t already know, it was by doing exactly what I am right now — blogging! She is a normal human being like you and me, and she is an exceptionally-gripping writer and cook/baker. Yet, at any point and time, you can find people lined down the block to experience her food and hopefully catch a glimpse of anyone in her family at the store. Why do people flock towards the remote town of Pawhuska? The fame of The Pioneer Woman, of course! That might not be the reason for all who visit. In our case, we really wanted to sample some of her yummy cooking and spend some time together in a fun environment, and we got it. My point is, people put this normal woman and mother on a pedestal, separating her from reality. Another time last weekend that I experienced an encounter of fame is through one of my favorite weekend activities: watching Netflix. On Netflix, I stumbled onto a documentary about the body guards of some of the most famous people in the world, and the great lengths that these people have to go to in order to keep these celebrities not only out of harm’s way but also, at times, alive. One of the body guards remarked how he was surprised how strong five rabid teenage girls can take down several grown men in order to get close to the singer he represented. Both of these occasions are just a few of the daily reminders I see of the fascination with fame in our culture today. I asked myself, “Would it be like this if Jesus were on the Earth today? Then I got more specific. Would I be standing in line? How would I act if I were able to meet Him here on Earth before I do in Heaven some day? I know one day when I do meet Him, the moment will be indescribable. All celebrities I met in this life will leave my mind. He will be the greatest. Isaiah 40:21-26 says, “Do you not know? Have you not heard? Has it not been declared to you from the beginning? Have you not considered the foundations of the earth? “God is enthroned above the circles of the earth; its inhabitants are like grasshoppers. He stretches out the heavens like thin cloth and spreads them out like a tent to live in. “He reduces princes to nothing and makes the judges of the earth to be irrational. They are barely planted, barely sown, their stem hardly takes root in the ground when He blows on them and they wither, and a whirlwind carries them away like stubble. Words can barely do justice to the matchless power and greatness of the Lord. But I encourage you, next time you become star struck by a famous person here on earth, consider that they are like a mere grasshopper to the Lord. We begin and end with Him and Him alone. We wake up and go to sleep by His name. Consider His greatness and eternal fame compared to their temporary fame and fortune. Turn your awe and fascination towards to Lord, the creator of the heavens and earth. For where your treasure (and admiration) here on earth is, there your heart will be also (Matt. 6:21)!